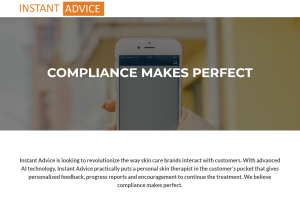 Instant Advice provides over-the-counter products (currently for acne) and mobile apps providing advice for a successful result. Beconfident resells Instant Advice’s acne products, so available apps are Beconfident branded. Abiro acted system architect, service/app developer, system admin and technology partner responsible during the development of solutions for acne treatment and teeth whitening for Beconfident during 2014 and 2015. Abiro assisted with project management and requirement consolidation when developing a follow-up acne solution for an undisclosed customer during 2016. Abiro also made the re-design of the corporate site during 2017. Primarily Q4 2014 to Q2 2015, and Q2-Q3 2016.